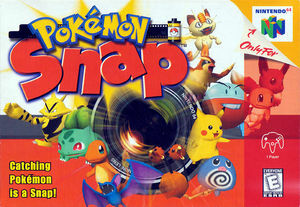 Pokémon Snap, known in Japan as Pokémon Snapshot (ポケモンスナップ, Pokémon Sunappu) is a first-person rail shooter and simulation video game developed by HAL Laboratory with Pax Softnica and published by Nintendo for the Nintendo 64 video game console. Originally developed as an 64DD title, it was later brought to a standard N64 cartridge due to poor sales of the 64DD peripheral. The game plays similarly to other on rails first person games: the game moves automatically as you control shooting from the protagonist's perspective. The objective of the game is to take pictures of Pokémon, using items such as apples and "pester balls" to achieve better shots. After each round, players are judged based on the quality of their photos. If the default Emulated CPU Clock is used with Dual Core on, it's possible that the game will frameskip over one of the three Pidgeys in the tutorial, essentially locking up the game until a third Pokémon is seen. Setting the Emulated CPU Clock Override to 150% or higher, or using single core, will prevent this. The game will be unable to detect Pokémon, breaking the tutorial. Normally, the tutorial starts with locking out the joystick and only allows you to zoom and take pictures, then it will freeze the world once a Pokémon passes the cursor allowing you to take a clear shot of that Pokémon, then continues once it confirms you took a picture of a Pokémon. If you ever to take a picture anyway, it will be blank and unusable as you try to show them to Prof. Oak, and you will be forced to take the tutorial again as if you've discarded the clear shots of Pokémon taken from last tutorial. Disable EFB Copies to Texture Only to correct this. This option has since been added to GameINI. The Widescreen hack has Projection and Camera issues that can be fixed with a Gecko Code. The graph below charts the compatibility with Pokémon Snap since Dolphin's 2.0 release, listing revisions only where a compatibility change occurred. This page was last edited on 20 December 2017, at 04:27.